When Chris Waller talks about Winx he often uses sporting analogies and in those terms the champ has had a perfect pre-season, is match fit and all set for the big game next Saturday. As the world’s best racehorse made a public appearance at Royal Randwick, seven days ahead of her attempt at 30 straight wins in the Group 2 Apollo Stakes (1400m), Waller was moved to put her status in sport into context. At least how he views Winx. “The same as a coach of a Cathy Freedman or Ian Thorpe or Don Bradman’s captain, you name it,’’ Waller said. Hugh Bowman unsaddles Winx after her gallop at Randwick on Saturday. “Can Winx be called an icon? I guess the public will decide that in time. “That’s how she is in our eyes and we are making sure we make the most of that responsibility. “She’s gone from a sporting name to a household name. People know us as Winx’s trainer, Winx’s jockey, Winx’s strapper, Winx’s owners probably more than they know our names individually. 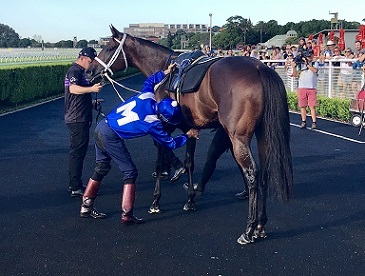 It’s safe to say Winx wasn’t extended by Hugh Bowman as she worked with stablemate Egg Tart, a likely rival in the Apollo, on the Randwick course proper. Somewhere around 800 people were looking on, taking in the Winx experience up close by chatting with owners Debbie Kepitis and Peter Tighe, jockey Hugh Bowman and taking selfies with trainer Chris Waller. It’s widely believed that the Sydney autumn carnival will be Winx’s final preparation so moments like Saturday morning will be rare. So is a horse with 33 wins from 39 starts, 29 consecutive victories including 22 Group 1s and she’s about to pass $23 million in prizemoney. “She’s an amazing horse to carry on for so long without being beaten,’’ Waller said. “It’s the business end in the next few weeks of her career and for the fans they expect Winx to win each and every time. Bowman headed onto the track on Winx’s back just looking for confirmation that the Winx engine was still purring as it was when we last saw her in the spring. He said the gallop was a different story to her two official trials and he jumped off the champ beaming and with a ‘bring it on’ sense about him for her return next weekend. “As we know in her trials she does tend to look after herself but judging on what I felt this (Saturday) morning I’m looking forward to the race next Saturday,’’ Bowman said. “She really put the afterburners on this morning, although I didn’t let her use them I certainly felt them. Among Winx’s likely opposition in the Apollo, a race she won in 2016 and 2017, will be last season’s champion three-year-old Trapeze Artist and the grand galloper Happy Clapper. Waller confirmed following the Apollo that, with the usual caveat of all being well, Winx will attempt to match Tie The Knot’s four straight Chipping Norton Stakes record on March 2 then attempt four straight George Ryder Stakes at Rosehill on March 23. Then it’s off to Royal Randwick to seek a hat-trick of Longines Queen Elizabeth Stakes victories on April 13. And that could be the last time we see horse that has become a sporting icon.